It is a new year. We are all planning, making resolutions, forging ahead in our lives with a new found feeling of hope. Why? Why wait until the calendar turns? Why don’t we embrace this feeling daily? Why is it so hard to allow ourselves that grace? I am all for it to be honest. I know I fall short every single day. At bedtime as I think about my day and say my prayers I am always a little disappointed. I am really quite good at finding fault in myself. The litany of “I could have handled that better”, “I should have (fill in the blank)”, “If only I had…”. Those go through my mind and I conclude with asking God to forgive me and give me the wisdom and grace to be better tomorrow. So here’s to each day being new. A fresh start. No more waiting for the weekend or next week or next month or even next year. Join me in the now! Opportunity is knocking. Why make it wait? 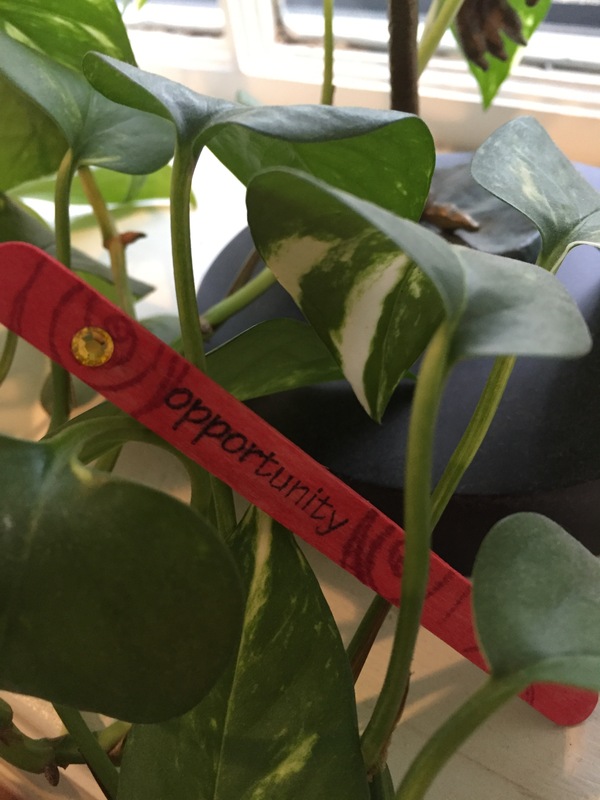 I have this small stick with the word opportunity stamped on it. I picked it up and got a small sliver in my finger. Looking at it I thought, “Wow! That is really all I need. Just to see a sliver of opportunity.” We have all heard the line, “Learn to listen. Opportunity could be knocking at your door very softly.” But we need to see too! We need open our eyes to all that is possible. Something small and seemingly insignificant might just be our big thing! So my prayer is to have not just ears to hear, but to have eyes to see. If you look up the definition of opportunity it states that opportunity is a time or place favorable for executing a purpose; a suitable combination of conditions; chance; fitness; convenience of situation. That is today! That is right now! Rejoice for opportunity is all around you and me. I have been blessed with wonderful opportunities in my lifetime. The people I have met who have been instrumental in shaping me; teachers, friends, mentors, and pastors. I went to excellent schools, I have family and work and leisure time, and I can make decisions for myself. These are all indeed favorable. What about the opportunity in the not so favorable? Here is the good news! There is opportunity in our losses. There is a chance to learn a new set of skills and to grow in forgiveness, compassion for myself and others, humility, austerity, generosity and so much more. Please listen to that voice inside that is telling you to take a chance. Open your eyes and see those opportunities that are being placed before you on your path. And remember this is a journey and not a destination. We will never fully arrive. So use all your senses and grab those opportunities while you can. This is your life after all. This entry was posted in Inspiration, Motivation, Nourishment, Reflections, Uncategorized and tagged daily life, don't worry, fresh start, good choices, new year, opportunity, resolutions, strength, wisdom. Bookmark the permalink. Even negatives in our lives can be turned into positives if we learn something from them.